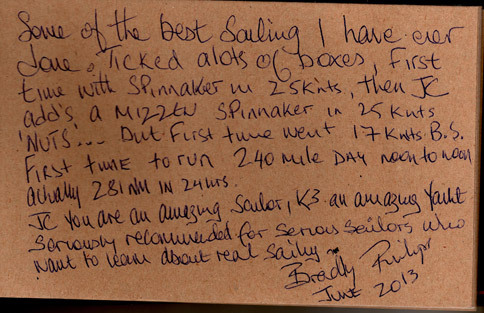 “Some of the best sailing I have ever done. Ticked all the boxes. First time with spinnaker in 25 knots, then JC adds a Mizzen spinnaker in 25 knots ‘NUTS’… But first time went 17 knots B.S. First time to run 240 mile day noon to noon. Actually 281 miles in 24 hrs.